There are some stories that never make it into the history books. It really is a shame. They are left in the silent pages of dusty journals, faded photos, and family stories. Yet it doesn’t mean they are any less important. The small, tiny, anonymous moments of life don’t always get recorded, but the pieces that are left show the rich, inspiring lives those before me have led. Pieced together, photos and stories tell the best stories, the ones that should really be in history books. For example, Isabella Christina Draper. She was raised in the south – the Deep South, in the middle of the Civil War. Isabella Christina Draper was born under unusual circumstances. She was born literally in the middle of war. 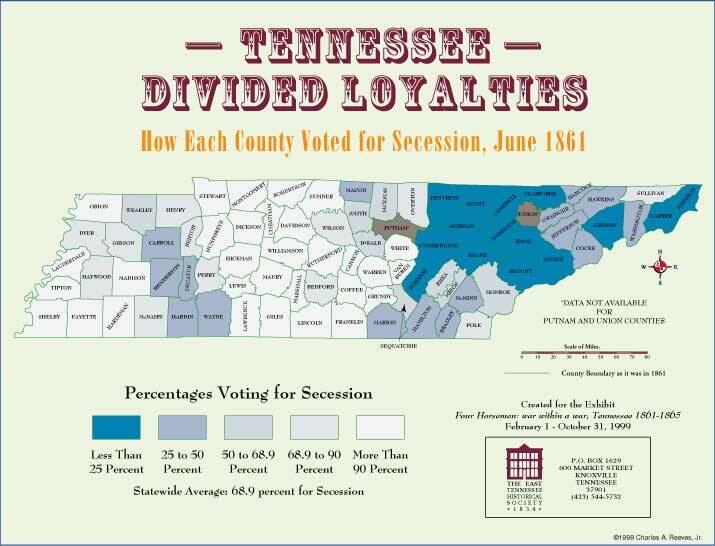 Her parents were farmers in Tennessee, and when War between the states broke out, Tennessee was a split state with the Middle and West Tennessee regions favoring the Confederacy, and East Tennessee taking a strong Union stand. 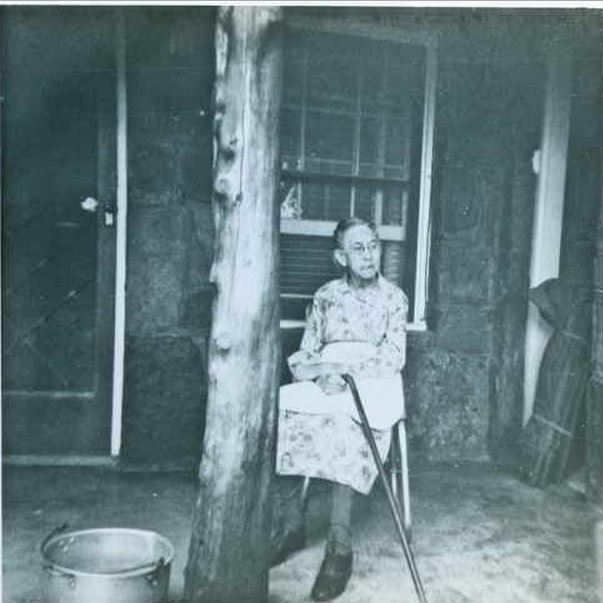 Isabella’s parents farmed smack along the border where the Union and confederate loyalties clashed (oral history of Cheryl Bowman Nesmith). Even if you don’t remember a lot from their 8th grade American History class, it is clear – growing up in the middle of war is harrowing. Often, it is the women and children that suffer the most. An entry retold by her great-great granddaughter shows the trials of growing up in war. I can’t even imagine what it would be like to live through such conditions. The untold fear, nightmares, and hunger. What would it be like to never experience a sense of normalcy? 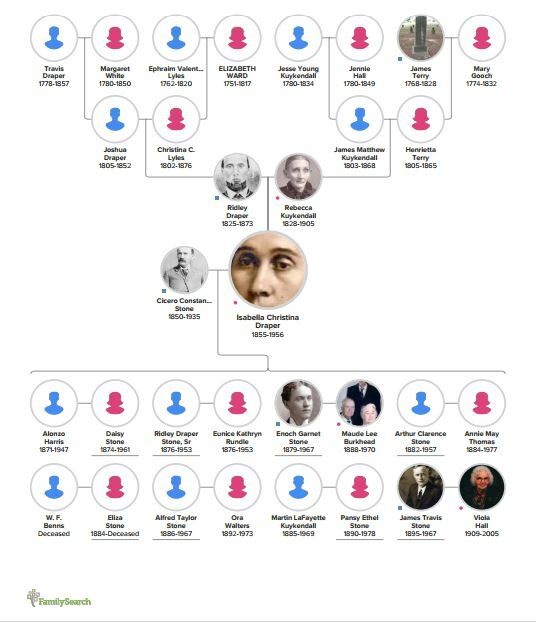 On 2 Oct 1873 Isabelle or “Belle” married Cicero Constantine Stone, or C.C. stone. She was 18 years old, he was 23. In 1873, animosities between the two loyalties still raged in Putnam County and when Belle married C.C. Stone, she came into the marriage from a Confederate family, he from a Union one. 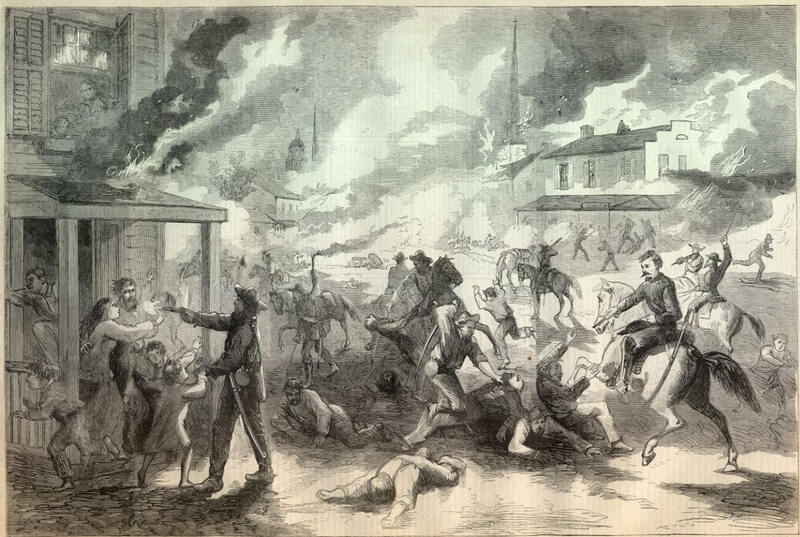 His family had to leave Tennessee immediately after the War due to their staunch Union affiliations and it was two to three years before the Stone family returned to Middle Tennessee. I’m sure discussions between the two got quite lively at times. Add to this the fact that C.C. was raised a Catholic and Belle was raised Church of Christ, one might say that even more “fuel was added to the fire”. My grandmother used to laugh at this because Bell raised every one of her kids, including my grandfather, in the Church of Christ. With C.C. being gone most of the time, I guess it never was a huge issue between them. C.C. 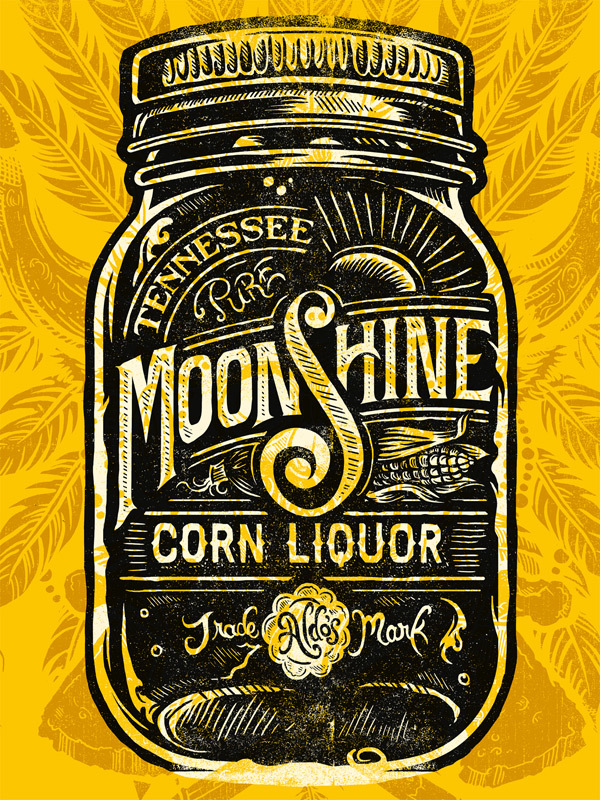 worked for the U.S. government as an Internal Revenue Ranger, breaking up moonshine still operations in the hills and mountains. He was gone from home a lot over the years and under constant threat of life. After spending decades wondering whether Belle would ever see her husband alive again, raising eight kids basically alone and running a hotel, again basically alone…” Belle had lived through a lot. “At the turn of the century, C.C. 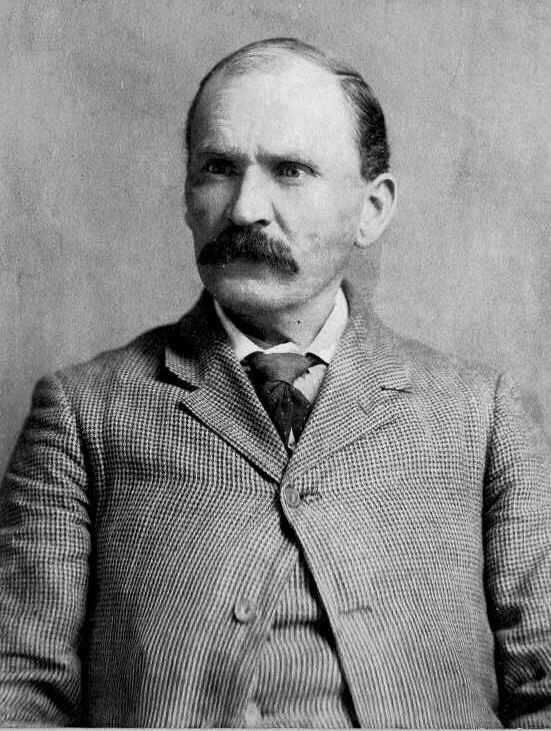 retired from the U.S. government, he and Belle sold the hotel and they with four of their remaining children moved west settling in Dexter, Chaves County, New Mexico Territory. You would think by now, after moving away, that events would settle down and perhaps Belle could find things to smile about. But, in 1909, when C.C.’s father, Enoch Stone, passed away, C.C. returned by train to Tennessee for the burial. Word got out that C.C. was coming back to Tennessee and the threat was made by some of the mountaineering families that he would be killed as soon as he got off the train. He told them “bring it on; I’ll be there to meet ya”. Again, Belle was left wondering if she would ever see her husband alive again and this was hardly something to smile about. Fortunately, nothing happened; C.C. tended to his business and returned safely to New Mexico” ( Cheryl Bowman Nesmith). 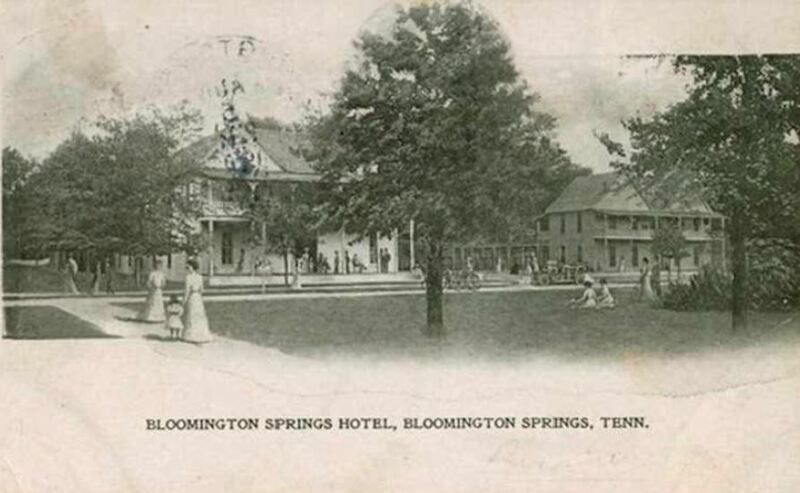 This is a photo of an old postcard (complete with stamp bleeding through from the back) of the Bloomington Springs Hotel in Bloomington Springs, Tennessee. This is the hotel that C.C. Stone and his wife Belle Draper Stone owned and operated until they sold it and moved the rest of the family to the New Mexico Territory after C.C. completed his time as a U.S. Ranger with the U.S. Internal Revenue Service. Photo courtesy of Judy Duke, Museums Administrator, Cookeville History Museum and Cookeville Depot Museum in Cookeville, Putnam County, Tennessee. Despite the hardships of her life, Belle lived to old age. This was cropped from a group photo of her and her children, in-laws, grand and great-grandchildren at a Stone Family Reunion. She was around 90 years old. Original owned by: Gladys Stone Hughes. 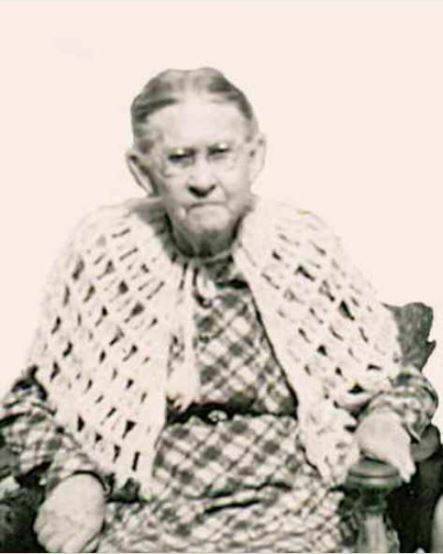 Isabelle Christine Draper Stone is sitting and wearing a shawl around her shoulders. 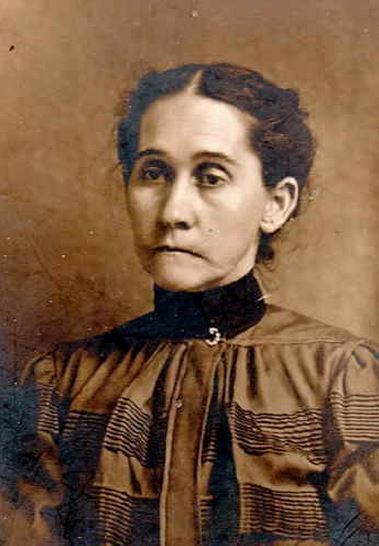 She was around 90 years old at the time of this photo. 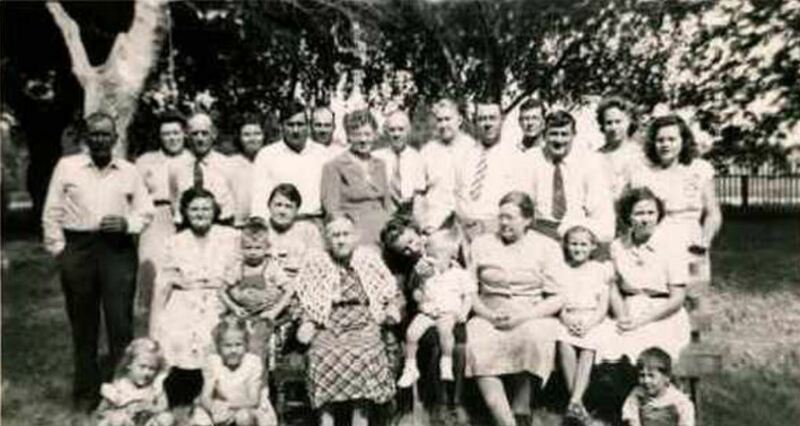 Standing L-R: Arthur Stone, Dorothy Kuykendall, Alfred Stone, Josie Stone, Charlie Stone, Walter Stone, Peggy Stone, Garnet Stone, Maud Stone, Fate Kuydendall’s brother, Harry Kuykendall, Fate Kuykendall, Bonita Stone and Christine Kuykendall. Sitting in chairs L-R: Mae Stone, Aubry Stone, Ora Stone, Isabelle Draper Stone, Wanda Stone, Stuart Stone, Pansy Stone Kuykendall, Doris Kuydendall and Eunice Kuydendall. Children in front L-R: ?, Desi Mae and Danny. Photo owned by: Gladys Stone Hughes. 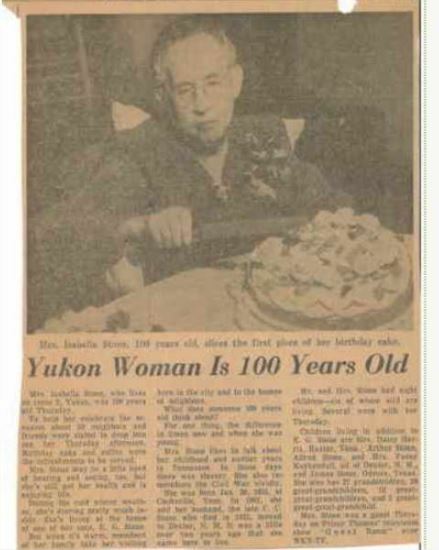 In fact, she lived to be over 100 years old. This was taken on her 100th birthday. Isabelle is sitting and is flanked from left to right by: Arthur Stone, Walter Stone and Garnet Stone. 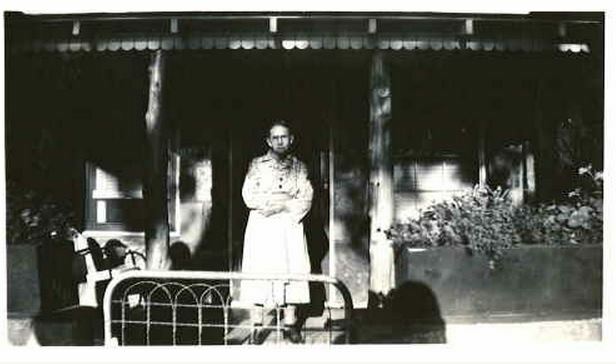 Photo owned by: Gladys Stone Hughes. If you ever think your life is hard, just look at history. There you will found countless stories of perseverance, courage, and true grit. Belle Draper, is one of those stories. She endured hunger, pillaging and hardship. She also practically single-handedly raised 8 children and ran a large hotel, all while constantly fearing for her husband’s life. She may not be in the history books, but her story is in my book – never to be forgotten.